Maca, an herbal food from the Andean Mountains, has been firmly rooted in the culture of the land since before Incan times, and is now known as a nutritional giant. Maca originated in the Andes at high altitudes and rough climates. Based on evidence from cave paintings, it is believed that maca was first domesticated as far back as 3,800 BCE in what is now the Junín region of Peru, and it has been a staple food for native tribes of the Andes for centuries. Improving energy and vitality. Maca has been shown to enhance mood and increase endurance, thus contributing to boost general energy levels. Relieving menopause symptoms. 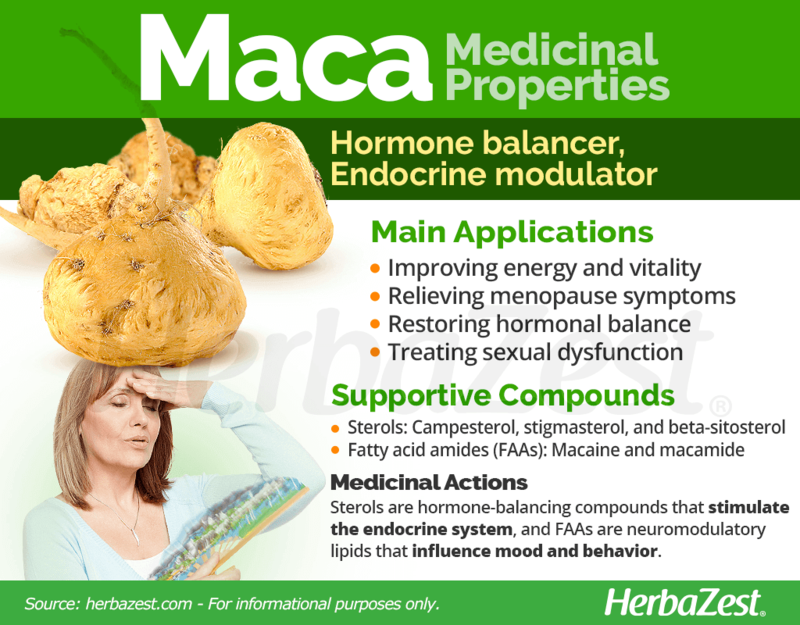 Maca supplements are used to relieve hot flashes, night sweats, mood swings, hair loss, low libido, vaginal dryness, and other menopausal symptoms. Restoring hormonal balance. The maca herb can help relieve cramping, breast pain, mood swings, and other premenstrual syndrome symptoms. It can also help treat the symptoms of polycystic ovarian syndrome (PCOS), such as acne and excessive hair growth. Treating sexual dysfunction. This Andean root has been shown to relieve sexual dysfunction and improving fertility in both men and women. The maca plant contains sterols (campesterol, stigmasterol, and beta-sitosterol), which are hormone balancing compounds that stimulate the endocrine system, and fatty acid amides, or FAAs (macaine and macamide), which are neuromodulatory lipids that influence mood and behavior. Both sterols and FAAs contribute to the following maca therapeutic properties: balancing of hormonal secretions, stimulation of body metabolism (energy and vitality), stress reduction, antidepressant activity, memory improvement, and enhancement of sexual drive. 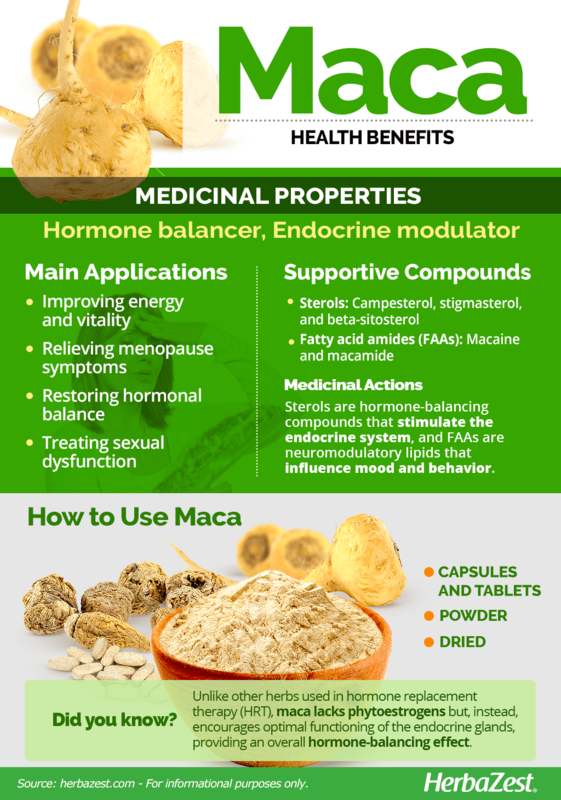 Maca root has proven beneficial mainly in the treatment of hormonal disorders, particularly in women entering menopause and men with sexual dysfunction. Well known herbs used as substitutes for synthetic hormones in hormone replacement therapy (HRT) are soy and red clover, both of which affect estrogen; black cohosh root, which influences luteinizing hormone (LH); and wild yam, which stimulates progesterone. Unlike the aforementioned herbs, maca lacks phytoestrogens but, instead, encourages optimal functioning of the endocrine glands, providing an overall hormone-balancing effect. Maca is likely safe for most people when boiled before being consumed. Few to no side effects have been observed in studies aside from mild digestive disturbances. Currently, there are no known medical interactions with maca. However, little research exists on the herb, so a doctor should be consulted before beginning a regimen. Pregnant or breastfeeding women should consume it with caution because its effects on infant development are unknown, and those with hormone-sensitive conditions should avoid maca because of its effect on the endocrine system. 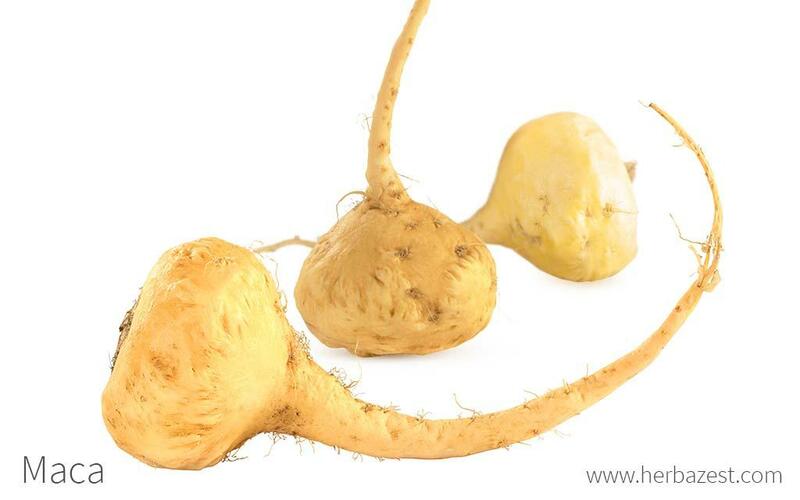 Maca possesses not only great medicinal value, but also boasts nutritional benefits. For this reason, it is regularly consumed for nourishment by the natives of the Peruvian highlands. Andean maca root is an excellent source of zinc, a trace mineral that is essential for growth and development, as well as for immune system health, proper breakdown of carbohydrates, and the senses of smell and taste. Good amounts of iron and dietary fiber are also contained in dried maca, along with small quantities of other important nutrients, such as calcium, potassium, magnesium, phosphorus, and vitamin C (ascorbic acid). Two teaspoons (10 g) of maca powder provide 33 calories and 7% of the daily value for dietary fiber. Maca has been used for millennia in the Andean region, both as a remedy and as a staple in the diet. Today, it can still be used as a culinary ingredient, but it is more common outside of the Andes to see it in powdered form as well as in herbal remedies and dietary supplements. Pure powder. The dried and powdered roots of maca can be added to juices, smoothies, and even baked goods for a nutritional punch. Dried. In this form, as raw chips, maca can be eaten as a tasteful snack or brewed into maca tea. Capsules. This is the most popular way of consuming maca as a supplement. Capsules carry a high concentration of sterols and FAAs, and can be taken in easy-to-swallow, fixed daily doses to support hormonal balance. 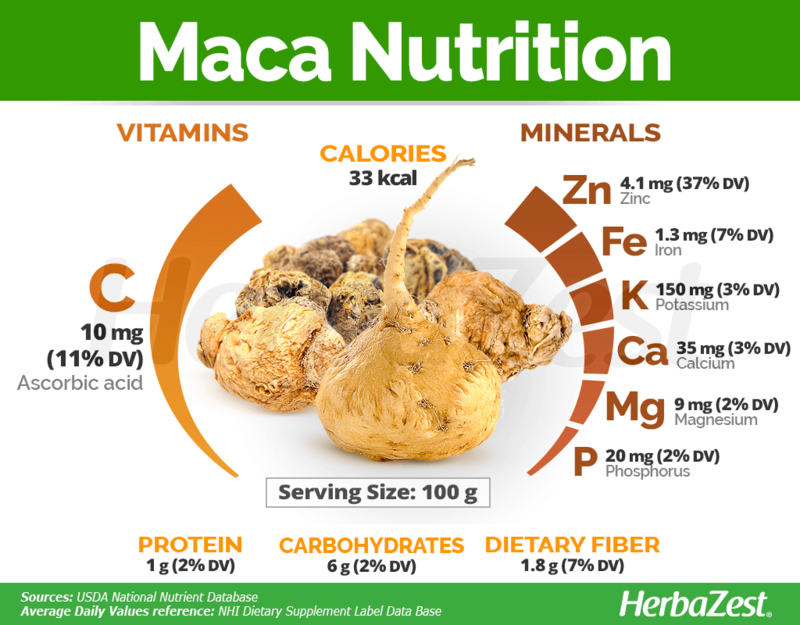 Maca is most commonly found in powdered and capsule form, although dried chips are also available as a snack in some specialized stores. Maca roots are usually ground and can often be found as a gelatinized powder, which is usually more digestible but lacks some essential nutrients that are fully present in its pure, organic powder version. Pure maca powder can be found in some health food stores year-round, as well as via online retailers. Furthermore, the dried roots of maca are available as chips in some organic markets. Many consumers prefer to take maca capsules and tablets as they offer a consistent dose. Online stores, as well as internet retailers, offer the most variety of brands and dosages, which are available at a range of price points. Since the amount of vitamins and active compounds can vary depending on the brand, it is recommended to read the labels carefully and look for certified organic products, ideally processed and packaged in their places of origin. Maca thrives in mountain regions, making it difficult to grow in moderate climates. It grows best in habitats like its native one, which is at altitudes of 12,500 – 16,000 feet (3,800 – 4,800 m) above sea level. Moreover, it is a difficult plant to propagate. Because it has not been cultivated widely outside of the Andes, it is unclear whether it can be grown productively in other locations around the world. Useful maca growing guidelines can be found in the herb garden section. Maca grows close to the ground and generally produces 12 - 20 leaves per plant. The leaves grow as rosettes, and the plant bears beige flowers that give way to small fruits with seeds. Below the soil surface, maca has a fleshy, underground root, known as the hypocotyl, which grows seven inches (18 cm) deep and can reach up to 3.5 inches (9 cm) in diameter, and from which most of the plant's culinary and medicinal preparations are made. 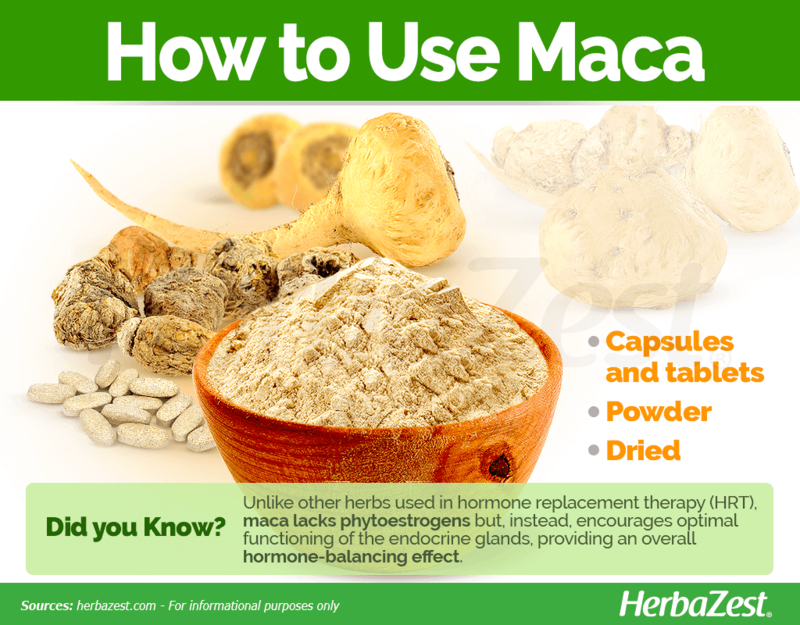 Maca may also be called Peruvian ginseng, maka, or maca-maca. Maca, or Lepidium meyenii, belongs to the Brassicaceae family, which which comprises about 360 genera and over 3709 species - mostly herbaceous plants -, several of them with great medicinal, nutritional, and economic value, such as arugula (Eruca sativa), broccoli (Brassica oleracea var. italica), cabbage (Brassica oleracea var. capitata), cauliflower (Brassica oleracea var. botrytis), and mustard (Sinapis alba), often called "cruciferous vegetables." Although maca does not have any subspecies, there are 13 varieties of the herb based on root color. Nearly 50% of maca grown today is of the yellow variety, which is sold on the market along with the black and red varieties. Though much less common, other root colors range from white to gray to purple, including bicolor varieties of all of the above. After native Andeans recommended the use of maca to Spaniards for livestock breeding, it became a commodity in the viceroyalty of Peru. Records from 200 - 250 years ago show that the Spanish crown demanded nine tons of maca from the Junín region of Peru as tribute. However, regarded as a "poor man's crop," the herb later fell out of common use, eventually reaching endangered status in 1982. In spite of this temporary decline, repopulation efforts and modern research have brought maca to the spotlight as a "superfood," and its popularity has resurged in the 21st century, extending far beyond its original scope. Because maca grows in harsh, bleak terrain where no other crops survive, it is a significant crop that allows Andean farmers to make use of land that would otherwise be barren. In recent years, maca has been commercialized, and it is now exported as an herbal medicine to the U.S., China, Japan, Europe, and other parts of the world, providing a boost to the economy of the region, as it is more profitable than potato. Peru produced 600 tons of maca in 2009, of which over 90% was exported to foreign markets. Incan soldiers were fed maca to improve strength and vigor, and youth were warned to avoid the plant, as it was believed to provoke lust. Livestock fertility enhancer. The use of maca to boost fertility has been extended to livestock, and it is sometimes used to facilitate breeding. Fodder. The leaves and sometimes the roots are used to feed herds, as well as guinea pigs. Pest control. Maca has also been used to stimulate population growth of pest-controlling insects, which helps to avoid the use of chemical pesticides. Although research on maca is still in its early stages, studies so far have shown that it is a tremendously useful superfood with several significant health benefits, particularly its ability to regulate hormonal imbalances during menopause and PMS.